It’s that time of year again! While most dog breeds have their own natural coat to regulate body temperature, sometimes they need a little extra help staying warm. It is important you keep an eye on your dog’s temperature to make sure he stays warm and healthy during these chilly months. What kind of products are good winter investments? Dog jackets help keep the cold out and the warmth in. The Huskimo Drover Dog Coat is great for chilly, wet weather as it is waterproof and deflects water and rain. The coat is reflective, comfortable, and tough enough to withstand outdoor activities and adventures. The WeatherBeeta Fleece coat is perfect for dry, cold weather. Its polyester fleece fabric is breathable, warm, and light enough for active dogs to move about comfortably. On the coldest of days, the Moleskin WeatherBeeta Dog Coat will keep your pup the warmest. It has a soft, suede exterior and is lined with warm fleece to trap in warmth. A warm bed your dog can curl into at the end of the day is a must during the wintertime. The Snooza Durobed Indoor & Outdoor bed is water repellant, UV treated, and made from tough denier fabric. It is easy to clean and can be used both inside and outside the house. For a dog who likes to nap in their own private hideaway, consider the Hidey Hole Snooza Pet Bed. The inside is soft and fluffy, and the hole provides a lookout for the dog so he can keep an eye on things from his safe spot. If you have small pets, the Woolly Igloo Pet Bed might be a better option. It is smaller and comes with reversible covers. The Snooza Futon bed is a great choice if you are looking for a bed that can also be used during the summertime. The fabric is manufactured to keep your pets cool in the summer, and toasty warm in the winter. This is perfect for a year round bed. Keep an eye out for limping or slow movements, as cold weather can worsen arthritis and joint pain. Take a look at the products listed above for ideas on how to keep your dog warm and comfortable while it is cold out. Poorly groomed fur can actually prevent your dog from regulating heat properly, resulting in a dog that is unable to stay warm. It is important to make sure you are brushing your dog several times a week, paying special attention to areas that tend to matt. 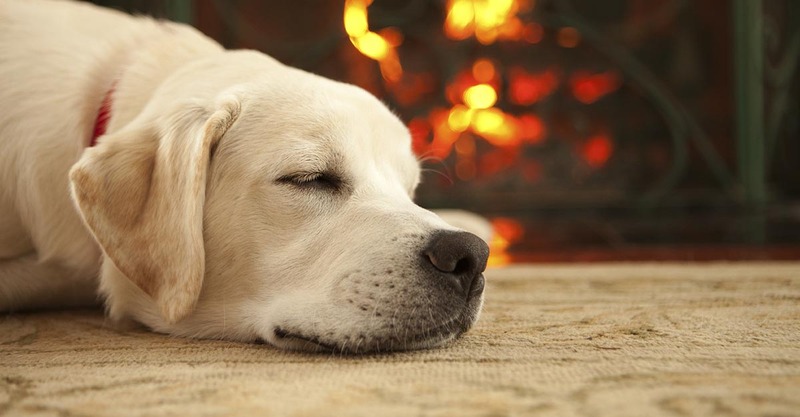 Bed warmers are great for keeping your dog’s bed warm in and out of the house during the winter. A microwavable bed warmer can be placed under a blanket in any bed and will warm your pal up in just a few minutes. Heated water bowls can be kept outdoors and prevent water from freezing in very cold weather. These are a necessity if you intend to keep your dog outside in the cold months. If you do not have a heated water bowl, avoid placing water outside in a regular bowl and keep your dog inside with full access to water. Do not leave your dog alone in the car in low temperatures. It is just as dangerous as leaving a dog in a hot car with limited ventilation. It is important to monitor your dog’s behavior to check for the warning signs of frostbite and hypothermia. Whining, shivering, lethargy and other unusual behaviors should be signs of concern. If you notice your dog behaving this way, or otherwise appearing uncomfortable, take them inside immediately and continue to monitor. If the behavior do not reside, you should speak to your veterinarian. If you follow the tips above, you will have no trouble keeping your best friend safe and happy this winter. Enjoy the season and stay warm!